Qu'est-ce qu'on dit? Hein? Merci qui? Royal Gold reported a 22% increase in year-over-year revenue for the second quarter despite lower gold prices. Earnings came in at $16.6 million, or up 70%. As I predicted last October Royal Gold was set up to grow rapidly as production at Mt. Milligan would increase attributable gold production by over 30%. 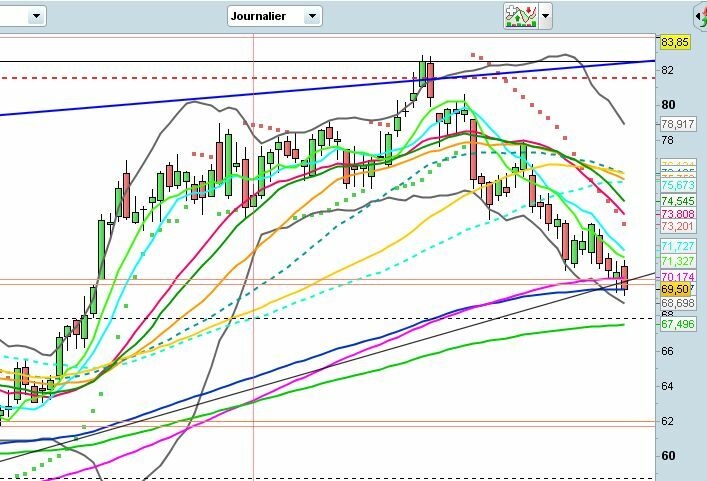 Chart semaine baissier sous 73.50, divergence de sommet 6 à 12 mois de baisse à prévoir. Les 38.63 seront battus, zone des 20$ à privilégier pour ce mouvement baissier. Nouveau signal de faiblesse, le gap haussier du 19/06 est invalidé. Royal Gold just released its third quarter fiscal 2015 financial results. The company blew away my expectations, with record gold production, solid operating cash flow and net income, despite gold prices down 6% from last year. I think Royal Gold is a must-own for any gold investor. Royal Gold just announced its financial results for the third fiscal quarter ended March 31, 2015, and I am pretty impressed with the results. For the quarter, Royal Gold reported record gold production of 60,823 gold equivalent ounce (36% increase), adjusted EBITDA of $57.7 million (16% increase), operating cash flow of $65.9 million (up 47%), and net income of $.38 per common share (up 23%). The company's adjusted EBITDA was 78% of its revenue, so margins remain very strong. And as of March 31, 2015, Royal Gold's working capital is $733.9 million, with total current assets of $759.6 million compared to current liabilities of just $25.7 million. The company also amended its revolving credit facility, increasing the maximum credit limit from $450 million to $650 million. Simply put, the balance sheet remains very, very strong, and I believe Royal Gold is in a great position to acquire more gold streams or royalties to grow its business. The strong results were led by a ramp-up in production at the Mt. Milligan mine, where 46,100 ounces of gold were produced (26,200 ounces net to Royal Gold, as it owns a 52.25% gold stream on all gold produced at the mine). This is by far Royal Gold's most important stream in my opinion, as it accounted for $29.7 million in revenue in the quarter, or 40% of total revenue. At the Cortez mine owned by Barrick Gold (NYSE:ABX), production increased a whopping 59% over the prior year due to an increase in surface mining activity. Cortez accounted for $5.02 million in revenue for Royal Gold. Another strong performer was the Andacollo mine - even though payable gold production decreased 8% in the quarter due to a failure of the tailings thickener and scheduled maintenance that impacted mill production in March, the stream produced $8.5 million in revenue, and Royal Gold expects a stronger second half of the year after the issues are resolved. Turning to the Mulatos stream, which is a mine owned by Alamos Gold (NYSE:AGI), attributable production increased 24%, mainly due to the timing of the final settlement of gold that was produced at the end of the fourth quarter, but not delivered during that quarter. Mulatos added $2.53 million in revenue for Royal Gold. This was a great quarter but the coming quarter's should be even stronger, as the company's gold stream on the Phoenix gold mine owned by Rubicon Minerals (NYSEMKT:RBY) starts producing. Rubicon has announced that mill commissioning is ahead of schedule, and the mine remains on track for production by mid-2015. Royal Gold owns a 6.3% gold stream on Phoenix until 135,000 ounces of payable gold has been delivered, then the stream goes down to 3.15%. The company paid its final commitment of $12.8 million to Rubicon in February 2015, so there are no more required payments to make. Finally, the company says it paid $7.5 million in a deposit on the Illovitza gold stream, and still has $167.5 million in remaining commitments. This is going to be a huge long-term growth driver for Royal Gold, as the stream gives the company 25% of all gold produced at the Illovitza mine, at a price per ounce of 25% the spot price of gold. Once in production in 2018, this mine should produce 95,000 ounces of gold and 35 million pounds of copper annually over a 23 year mine life. This means Royal Gold will net approximately 23,750 ounces of gold annually, and once 525,000 ounces of gold have been delivered, the stream will be reduced to 12.5%, or 11,875 ounces of gold annually. It's going to be a very profitable stream for Royal Gold in my opinion. Royal Gold's quarter was very strong, but I think the best is yet to come. I think the stock is a buy here, and I plan on adding shares in the coming weeks. Et pendant ce temps-là, FRANCO NEVADA (FNV) acquiert un "stream pure silver" sur la mine Antamina au Pérou. On peut dire que chez FNV, ils ont une vue LT et - peut-être - un bon sens du timing. Franco-Nevada will make a one-time US$610 million advance payment to Teck upon closing of the transaction. Funding is expected to occur in early-October with first silver delivery to Franco-Nevada in fourth quarter 2015. RGLD a l'une des plus fortes marges brutes de toutes les entreprises du S & P 500.